This is my entry for the "Cricut Me That" July Challenge. The theme is "Summer Fruits". We are to use fruits we find in the summertime. This challenge can be interpreted any way we would like. It's true that Oranges are best in the Winter. But, I eat them all year round including the Summer. So... I interpret them to be a Summer fruit. This card is 5 1/2" X 4 1/4". 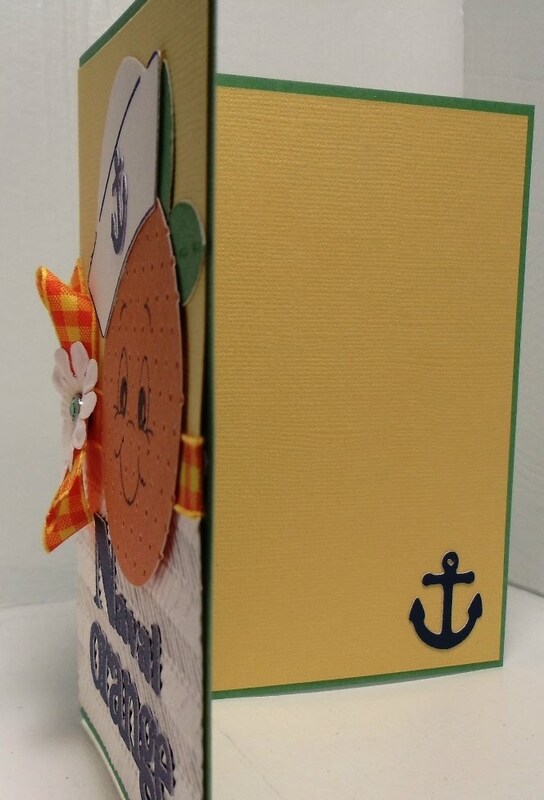 The yellow background is 5 1/4" X 4" inside and out. The bottom white is 2 1/2" X 4". 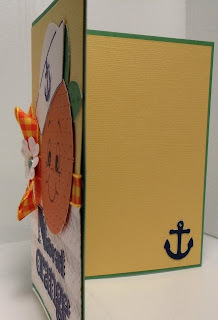 I ran this through my Cuttlebug with the Herringbone Embossing Folder. 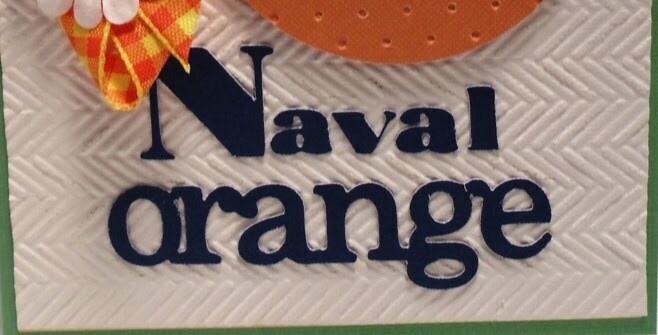 The Cartridges I used were Preserves for the Orange cut at 2 1/2" and the word Orange cut at 3/4". I ran the orange through my Cuttlebug with the Swiss Dots Embossing Folder and flipped it upside down. 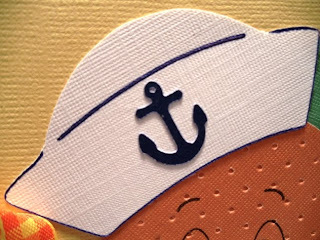 I used Paper Doll Dress Up for the Sailor hat cut at 7 1/2". I first cut with the dark blue Cricut Marker then with the blade. I used the Life's a Beach cartridge to cut out the anchors. The one on the Sailor hat is 3/4" and the one on the inside of the card is 1". 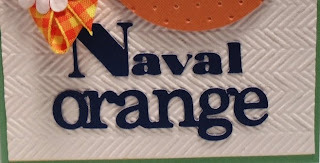 The word Naval was cut from Cindy Loo as individual 3/4" letters. 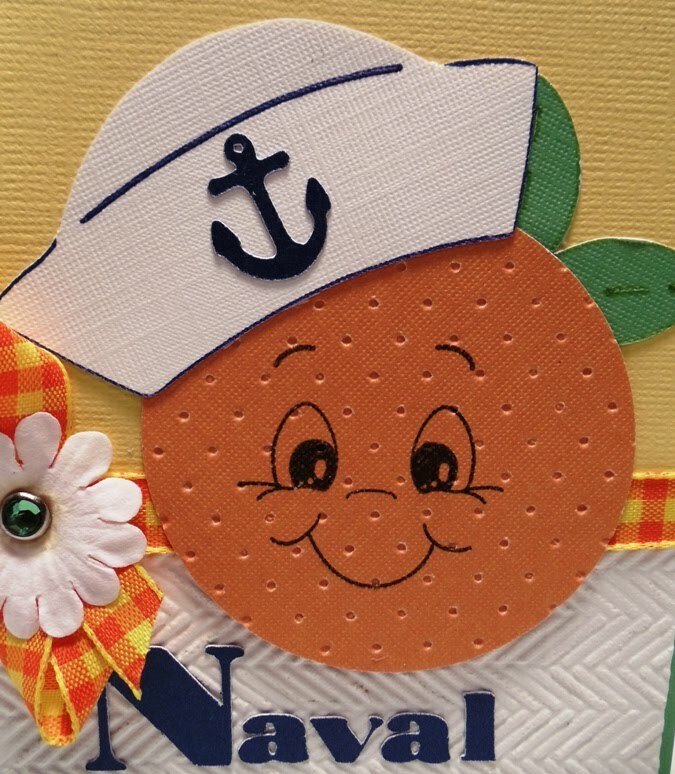 I then stamped the face on the orange using my large Peachy Keen Stamp face from the Everyday Character Face set. 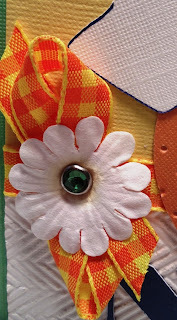 Finally, I finished it off with a flower embellishment, cute green brad to hold it in place and some pretty ribbon. Oh my goodness, WOW!! You did a fantastic job with this challenge. I love your orange, it's perfect!! Thank you for playing along with us over at Cricut Me That!! 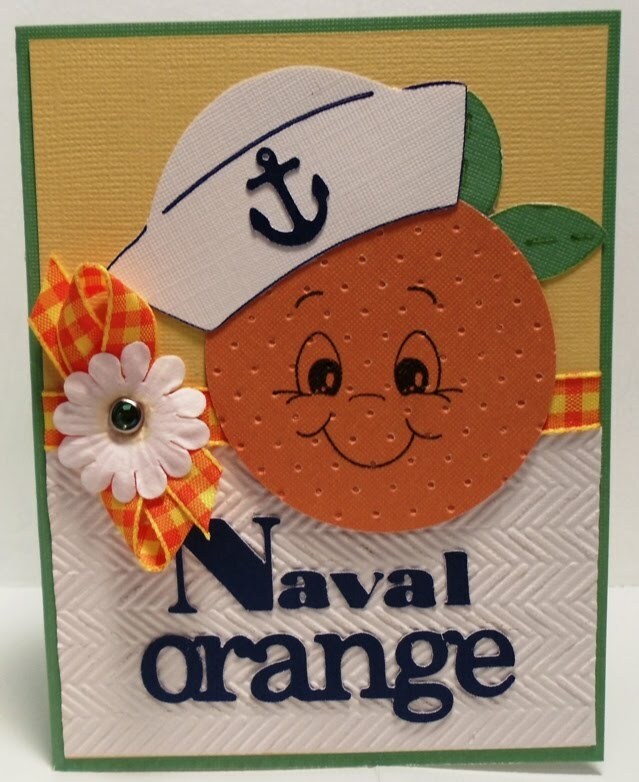 I am now a follower of your blog, I really like your card its so cute, thanks for sharing please stop by and visit me and if you haven't please I would love to have you as a follower at http://craftydeb-ddscrafts.blogspot.com/ hope to see you soon happy 4th !! 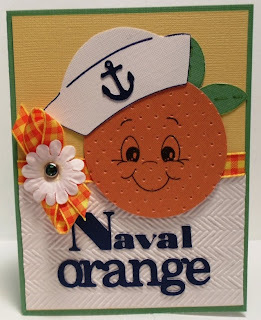 your card is amazing and oh so cute. OMG!! THis is the CUTEST EVER!! What an AWESOME job you did w/this card!! I LOVE IT! CONGRATS!!!! YOU DID A GREAT JOB....SUPER CUTE! Love the card so creative.